Nelson Mandela’s 100th Birth Anniversary would be celebrated by the South African Reserve Bank with the release of its first commemorative banknote series. The new series will include all denominations – R10, R20, R50, R100 and R200. The South African Mint will also be releasing a new commemorative circulation R5 coin to honour the great leader. Test packs of the commemorative banknotes were provided to certain important businessmen and financial institutions to make necessary arrangements or calibrations for cash processing, cash dispensing machines, ticketing machines etc. Even though these test packs followed strict confidentiality rules, some of the designs have been leaked on social media. The SARM will be releasing all the designs before the official launch that will happen on 13th July 2018 so that there is no confusion among the general public. More information about the notes and their security features would be shared when the notes are officially released. The new notes and coins would enter circulation by 18th July 2018 for a limited time along with the current Mandela banknote series and the R5 coin. Both sets will remain legal tender even after the limited period. 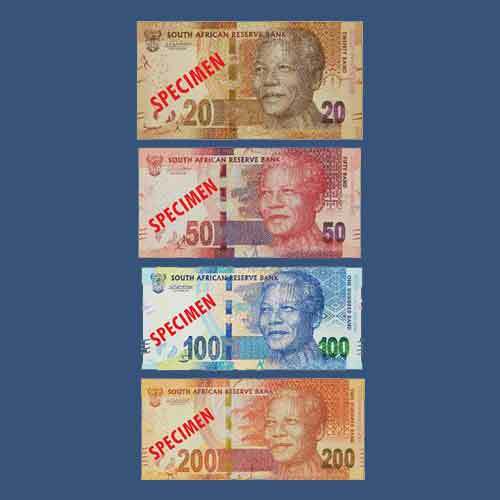 The current Mandela series of banknotes was introduced in 2012.